I hope that everyone had a really lovely Christmas and a nice relaxing Boxing Day. I had a very chilled Christmas just at home with my family eating lots and lots of food. Just how Christmas should be. I was also lucky enough to receive some lovely gifts so I though I would share with you some of the things that I got. The present that I haven't actually included in this post is a beautiful dress that I got from my parents. I had wanted this dress since the end of Summer (I know!). It is the most beautiful piece of clothing that I now own and I am so excited to wear it this New Years Eve! So I am going to do a whole separate post featuring that in my NYE outfit. I had a stocking to open in the morning with some really cute little things inside and then a few more presents that were under the tree. One of the best surprises was this beautiful freshwater pearl necklace from my mum. I love pearls, I have some pearl earrings that I wear pretty much everyday that this will look stunning with. I think this is really unique but still very delicate. And I think to add a bit of detail to a monochrome outfit this would look lovely. 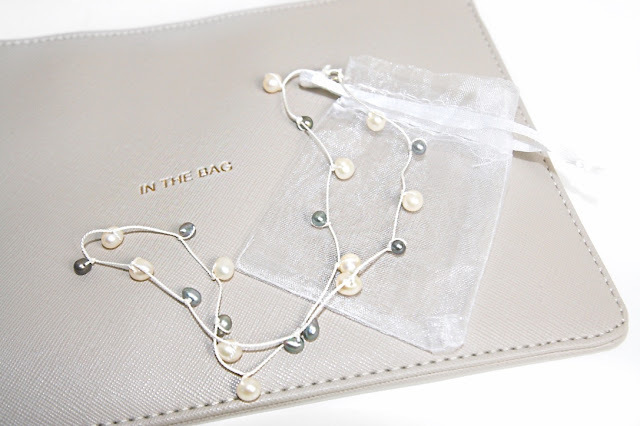 I also got this stunning grey pouch that says "in the bag" on it which I think is so cute! I also received some lovely beauty products. 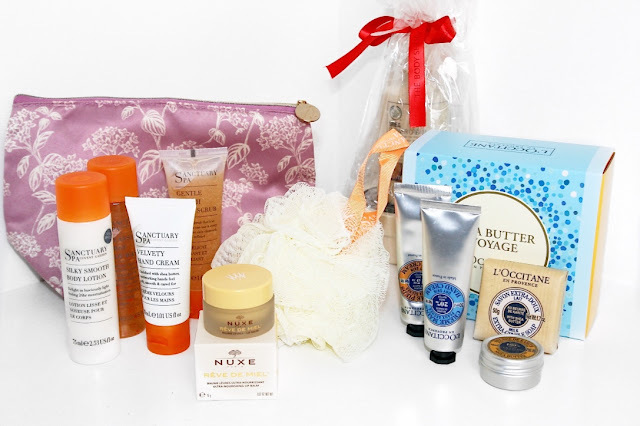 Including a The Body Shop shea butter shower set, which is my favourite scent. And then gift sets from two other brands that I have always wanted to try but never have. The Sanctuary set comes with a really pretty bag and the L'occitane product smell lovely. I can't wait to try all of these and let you know how I get on. Finally I also got this Nuxe Rev De Miel lip balm from my dad who recently went on a business trip to Paris and picked this up for me. My sister got me this gorgeous grey and white snowflake mug which I love. I have a bit of a thing for pretty mugs. I don't even have my own kitchen and I already have a bit of a collection! 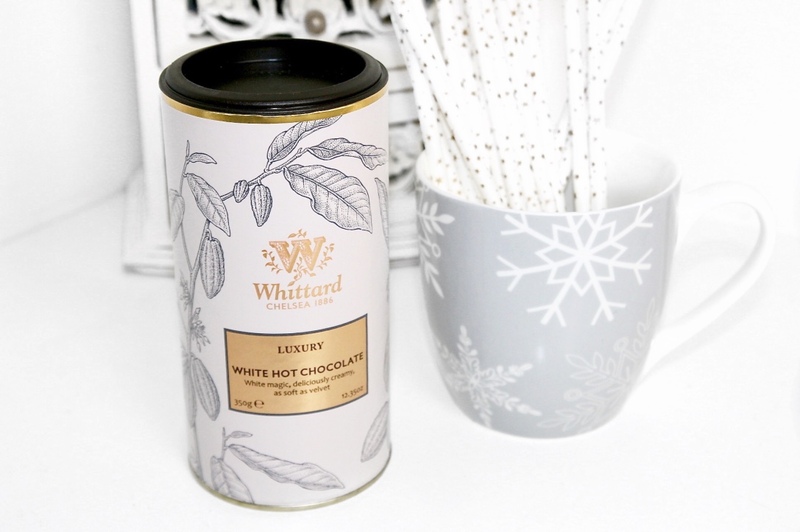 This Whittard white hot chocolate is my favourite (if you haven't tried this you need to!) so I was very happy to find this in my stocking. And I also got some pretty white and gold star paper straws so I can make some Pinterest worthy drinks! I got two books in my stocking as well. 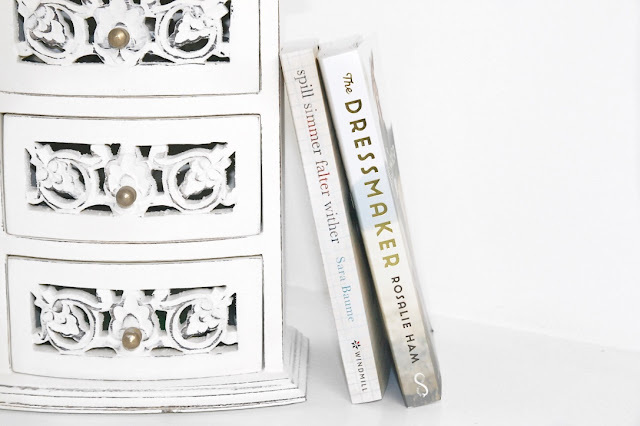 The first is The Dressmaker, which recently came out in the cinema but I didn't get to see it so I am very excited to read this. And the other is Spill Simmer Falter Wither which I will also let you know how I get on with. 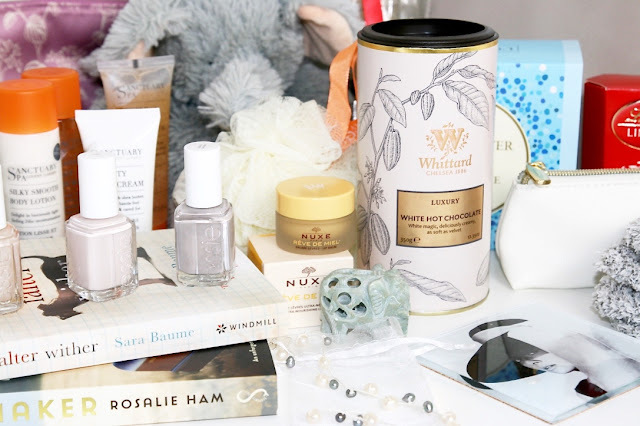 Forever elephant obsessed. And my friends and family know it! It sounds sad but I am starting to get a bit of a collection of little elephant ornaments. I have a stone a metal and a glass one and this one will join them on the shelves in my bedroom. 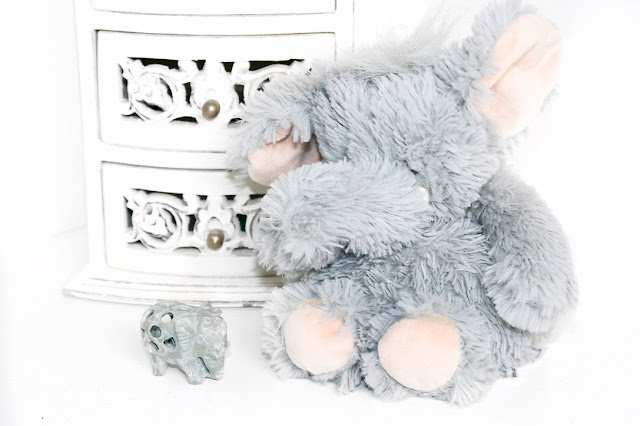 My boyfriend Jack got me this elephant that you heat up in the microwave. I love having a hot water bottle in the evening and this is just too cute! Jack actually made me a Winter Warming Box as my Christmas present this year which is just adorable. 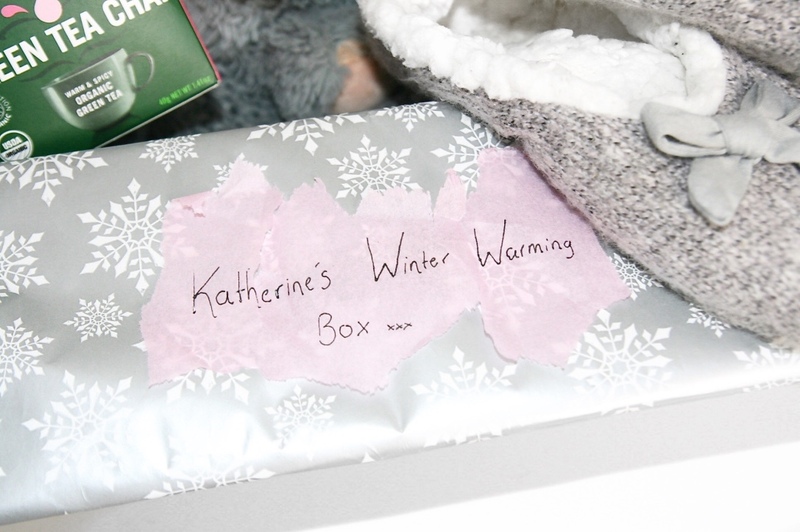 It was filled with so many lovely things for the perfect cosy evening in. Most of them grey as that is my favourite colour to wear! 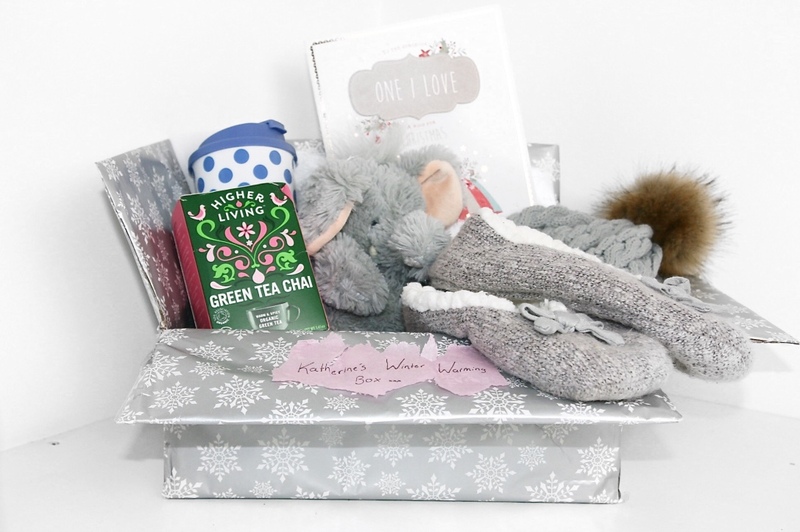 Inside my Winter Warming Box as well as the cute elephant I also got some little slippers (which I have lived in since), a travel mug with some hot chocolate, some nice green tea, some chocolate, a beautiful grey bobble hat and a scarf and mittens set. I think this is the cutest homemade present idea and so unique. Especially as he did it in my favourite colours with my favourite tea.